Here’s our guide to sightseeing in Zagreb, taking in the city’s most famous things to see. 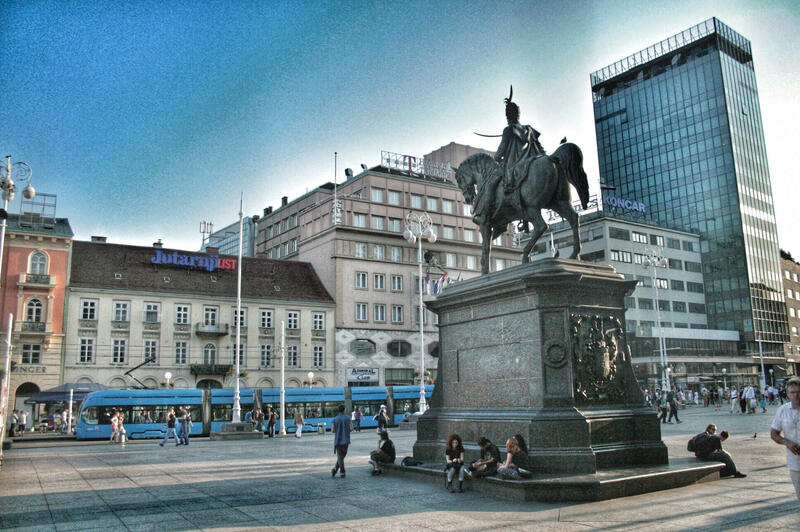 In the middle of the square you will of course see a statue of Ban Jelacic himself. Josip Jelacic is a Croatian hero (ban means viceory) who defeated the Hungarians in an uprising in 1848. His statue was erected in 1866 (in fact, pointing north towards Hungary) but was removed in 1947 after Yugoslavia was reformed post World War II. (It was removed because of its significance to Croatia – Yugoslavia was not a country to allow individual nationalism from its republics.) The statue was placed back on the square in 1990 just prior to the break up of Yugoslavia – he now, however, faces the other way. Whilst in the square, do take a look at the beautiful buildings on all sides. There’s also a plethora of cafes in the square – take a seat, order a coffee (or beer) and watch the world go by in the pedestrianised square. You will also see a small fountain in the square – this is Mandusevac Fountain, which is in a slightly different location to its original position. The original fountain derived waters from Medvescak creek, which flowed from Medvednica mountain. When facing north in the square, take the right-most street and head up it to see the twin neo-Gothic spires of the cathedral. Although parts of the cathedral date from the 13th century (and after), it was very badly damaged in an earthquake in 1880. 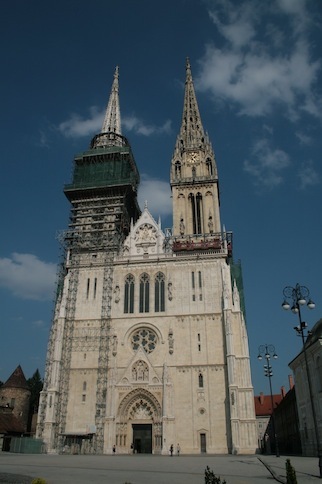 Most of the structure, including its spires, dates from the late 19th/early 20th centuries. Inside the cathedral you will find the tomb of Cardinal Stepinac (who was Archbishop of Zagreb from 1937 to 1960) which contains a sculpture by Croatia’s most celebrated sculptor, Ivan Mestrovic. The baroque Archbishops’ Palace is attached to the cathedral. Near the cathedral is Zagreb’s main market – the colourful Dolac. It is definitely worth a visit to see all the stalls and sellers in action. You will find many food items (particularly fruit and veg) on sale, although there will also be some craft items and other little bits and pieces on offer. You can also have an inexpensive meal in one of the fast-food kiosks close by. Walk along Tkalciceva Ulica towards the upper town and you will come to the one of the only surviving origial town gates from the 13th century. This gate, and its painting of the Virgin Mary, miraculously escaped the great fire of 1731 and for this reason is a place of pilgrimage, as you will see by the number of lit candles left here. 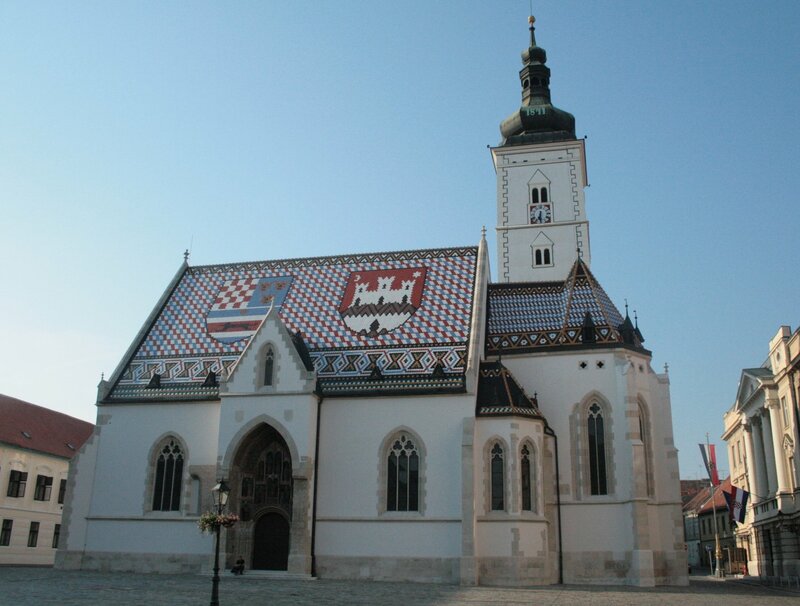 One of the most famous sights in Zagreb, if not in the whole of Croatia, is St Mark’s Church with its beautiful tiled roof featuring the coat of arms of Croatia, Dalmatia and Slavonia. The church was constructed in the 13th century; inside, there are works by Ivan Mestrovic. On the west side of the same square you will also find the Banski Dvori (which means Ban or Viceory’s Palace) and is today the Presidential Palace. Built in the 13th century, the good people of Zagreb are reminded of the time each day at midday when a cannon – called the Gric cannon – is fired. If you’d like to keep up to date with Gric cannon and the Lotrscak tower, it has its own Twitter feed: @gricki_top. Guess what? It tweets once a day, at midday, saying “boom!”. (Or, in fact, the Croatian for it…which is “bum!”.) 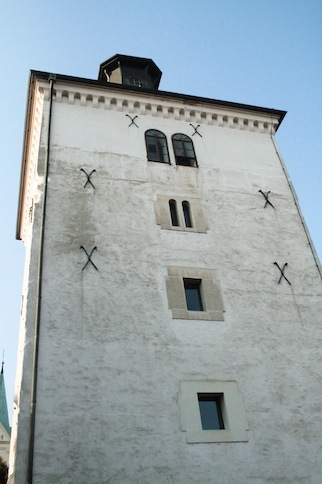 You can climb the tower for a great view of Zagreb. Just below the Lotrscak Tower is the uspinjaca, a funicular railway that was constructed in 1888. 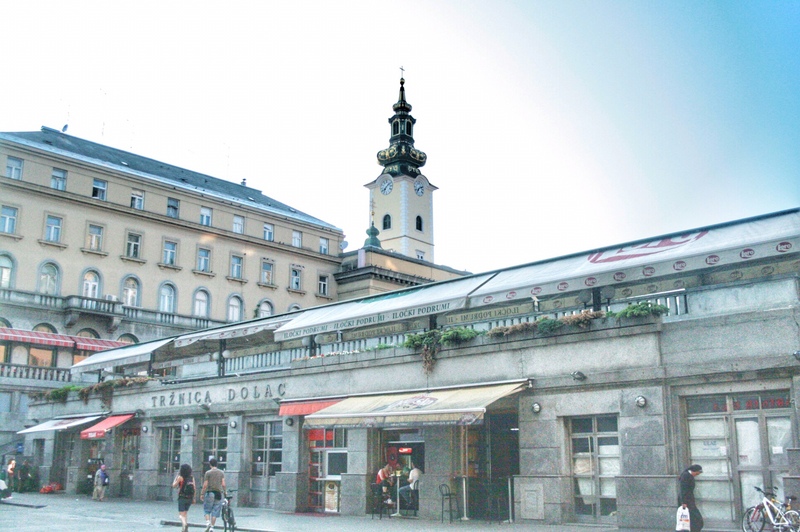 It is, in fact, the oldest public transport system in Zagreb – a year older than the horse-drawn tram. On a track of just 66 metres in length, it is also the shortest funicular railway in the world. Hop on for the ride from the Upper Town to the Lower Town – or vice versa. Zagreb Eye isn’t quite the same thing as the London Eye, but it still has glorious city-wide views nevertheless! Located in a skyscraper in the corner of the main square, this 16th floor observation deck will provide you with wonderful views over Zagreb’s terracotta-coloured rooftops and over the nearby sights of Trg ban Jelacic, the Cathedral, Dolac market and more besides. Priced at only 30 Kunas for adults, the Zagreb Eye is also open 365 days of the year so you can also check it out on days when other things might be closed (e.g. holidays)! Also open late into the night (until 10.45pm), you can visit at sunset or when it’s dark to see the twinkly lights of the city. There’s also a bar on the same floor so you can seek refreshment whilst enjoying the views. If you’re interested in an organised tour of the city, Viator have a 1.5-hour walking tour of Zagreb which takes in many of the most famous sights including those in both the Gornji (Upper) and Donji (Lower) Towns. For more details, please see their Zagreb Walking Tour page.